More than half of Amsterdam’s over 25,000 so-called ‘light’ moped riders admits they ‘almost always’ ride too fast. That was the news of this week. But it wasn’t really news. The Cyclists’ Union had already published a report last November 2012 that showed that 94% of the ‘light’ mopeds speeds. Some up to 60km/h where 25km/h is permitted. More than double the maximum speed! The average speed is 37km/h, that is 50% above the speed limit, yes, on average! The number of ‘light’ mopeds in Amsterdam grew at an astonishing rate, from 8,125 in 2007 to over 25,000 in 2012. Cycle paths in the Netherlands are heavily used. 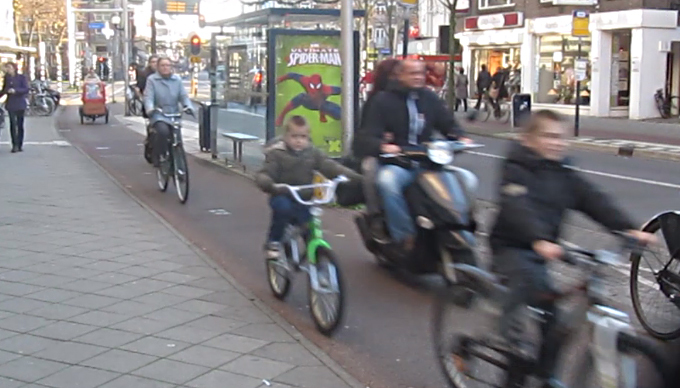 Here we see a bakfiets, an elderly woman, children on bicycles and a light moped. It is very dangerous when light mopeds are speeding on cycle paths like these. The current liberal minister for infrastructure remains deaf to the very reasonable complaints. Amsterdam wrote a letter to the ‘Tweede Kamer’ (“The Dutch House of Representatives”) asking to implement a helmet obligation to make the mopeds less attractive. But the minister does not want to do anything about this problem. And it is a problem, especially for cyclists, because these ‘light’ mopeds do their speeding on the cycle paths. The minister says the laws are there and she feels it is up to the municipalities. They only have to make sure the ‘light’ moped riders stick to the speed limits and everything will be fine. But why are those ‘light’ mopeds on the cycle path at all? Dutch law makes a distinction between motor cycles and mopeds. Two wheeled motor vehicles with an engine displacement over 50cc are motor cycles, which are treated as a motor vehicle and can use the motor ways. They are never allowed on the cycling infrastructure. Anything with an engine displacement under 50cc is a moped or scooter. Since 1974, a third type of two wheeled motorised vehicles was introduced into Dutch law, the ‘light moped’, in Dutch ‘snorfiets,’ which is a euphemism meaning ‘purring bicycle’. Those first light mopeds were indeed little more than a bicycle with an additional purring little motor. All mopeds had to have pedals and the light type had smaller wheels to distinguish it from the heavier type of moped. It was felt this light and slow vehicle would be dangerous on the road mixed with fast motor traffic, and so the ‘purring bicycles’ were supposed to mix with the normal bicycles on the cycle paths. The heavy type got a yellow license plate and the light type a blue one. But the laws evolved and so did the machines. Riding on the heavier type of moped means you have to wear a helmet (since 1975). That is not the case for the lighter type. For the latter the smaller wheels were not mandatory anymore since 1976 and the pedal requirement for both was dropped in 1985. Without the pedals, mopeds looked the same as scooters, especially the heavier type. The scooter version of the moped was much wider, and that width increased over time, so they became increasingly unfit for the cycle paths. They were too wide, too many and too fast. Since the speed for heavy mopeds is 45 km/h they could easily mix with the city traffic on the main carriage ways that drives 50km/h. This became law in 1999: the heavier type of moped was sent to the main carriage way. But from then on the lighter type became unexpectedly attractive. People didn’t want to mix with the car traffic, and they didn’t want to wear helmets, so they switched to the lighter type in high numbers. Suppliers saw that new demand, and they also noticed the light mopeds that looked like the heavy type sold best. Today there really is no difference anymore. Both types are generally exactly the same machine, but one is controlled to not go over 25km/h and the other has a limiter that prevents it from going over 45km/h. That limiter is easily disabled and that is what most riders do. That makes they can ride 60km/h on a machine that is supposed to not go faster than 25km/h on a cycle path where mothers ride with their children. A very unwanted situation, especially because cycling is also so on the rise. If police stop a speeding moped rider they must check whether the limiter was disabled. The number of accidents with mopeds is high and increasing very much. Amsterdam has analysed the crashes from 2001-2003 and from 2007-2009. In the first period there were 33 serious casualties per year on average (99 in 3 years) and in the second 3 year period there were 73 (219 in total). Moped riders endanger themselves most. From all serious injuries 19% is a moped rider, while their model split is only 2%. Percentage-wise the risk for cyclists seems low, the other party involved in a crash is only a cyclist in 9% of all moped crashes, but considering there were 50,000 mopeds (light and heavy in total) and 550,000 cyclists in Amsterdam at that time, it is a ratio which causes concern. Foremost, cyclists feel unsafe around all those mopeds. Of all cyclists, 14% say the mopeds are what they hate most in traffic. Early 2013, Amsterdam started a pilot project, in which they ban also the ‘light mopeds’ from some of the city’s cycle paths that go through 30km/h zones. Arguing that this type of mopeds go 25km/h and can therefore easily mix with motor traffic going 30km/h. But they wear no helmets, so you can’t send them off the cycle paths going through 50km/h areas, for which they are also too slow. 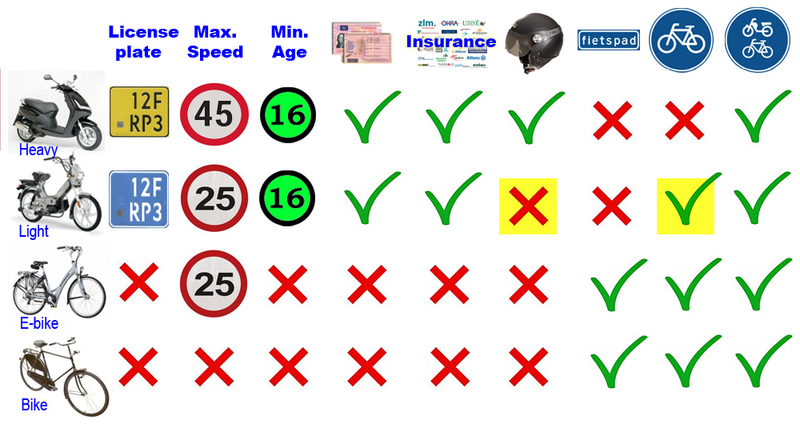 The Dutch policies of separating vehicle types, so different in volume and speed, forbid that. (Sustainable safety regulations). But people wanting change argue that under the same regulations you cannot go on mixing the big fast ‘light’ mopeds with much smaller and slower bicycles. For some years, experts have been calling for scrapping the whole light moped concept from Dutch law and to have all moped riders wear a helmet and have them all ride the same speed of 45km/h on the carriage ways. The city of Amsterdam asks exactly the same now and it is something the Cyclists’ Union would also welcome. Spokesperson Arien de Jong of the Cyclists’ Union said: “All the reasons for sending the heavy mopeds to the carriage way in 1999 are now valid for the lighter type too. They are too wide, ride too fast and cause a lot of pollution”. Indeed, the ‘purring bicycles’ from the past, to give people the ability to go slightly faster than a bicycle with little effort, do not exist anymore, and this law was meant for people who wanted to do that. Instead, there are now electric assist bicycles for these people who don’t want to go fast, but do need some help in cycling. There is no need for a ‘light moped category’ anymore. Scrapping the whole category from the law would end the terror of the mopeds on the cycle tracks. Stop the scooter nuisance! 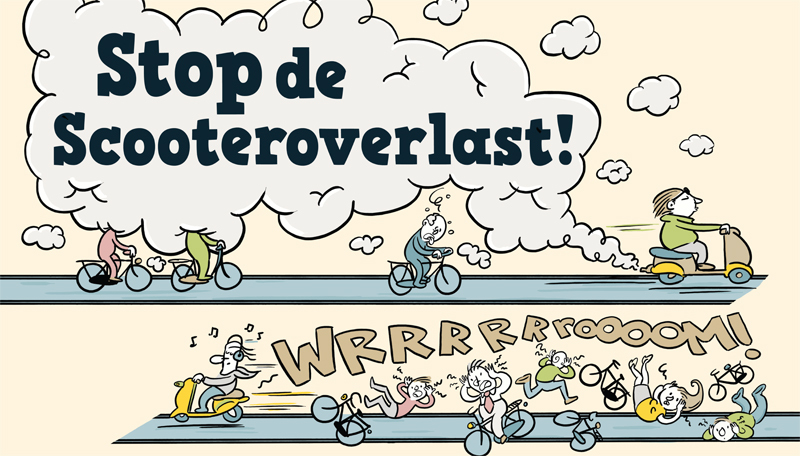 This poster by the pressure group against scooter nuisance on the cycle paths of the Netherlands, shows a lot of Dutch have had it with the scooters. Although the minister of transport doesn’t want to consider either yet (helmet obligation or riding on the carriage way), the producers of (light) mopeds now admit that it is perhaps too easy to disable the limiters. They also said the models are the same, because they do not want to produce a different type of machine for only the Dutch market. That would cost too much, but they are ready to reconsider. So it is perfectly clear the machines out there on the streets in the Netherlands, light or heavy, are really no different. The only visible difference is the blue or yellow license plate. People using ‘light’ mopeds with the limiter disabled are really only using a loophole in the law to be able to use the cycling infra (safer than the carriage way) without a helmet at speeds that infra wasn’t designed for. Society doesn’t take this anymore, pressure is building up. There is a pressure group with a website called: Scooter nuisance.nl who get ever more visible. But the heat is also building up in politics. The minister of safety and justice has announced he’ll look into the very low fines for people who get caught after bypassing the speed limiter. He was forced to do so after questions from representatives. It is very difficult to fine people, because the police have to actually test ride how fast the mopeds go. There is still hope something will change in the time to come. Until then, the Amsterdam alderman has proposed to implement speed cameras on the cycle paths to measure and record the speed of mopeds. That way the chance of getting caught when speeding on your ‘slow’ moped is at least increased.